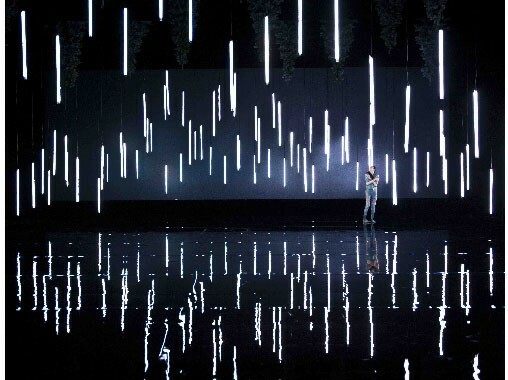 Artistic Licence Multichrome Tube LED fixtures have played a central part in the visual presentation of Isslottet at Den Norske Opera in Oslo where local distributor, Rubicon, supplied over 100 units to faciliate Øyvind Wangensteen’s highly imaginative lighting and video design. Isslottet (‘The Ice Castle’) is a modern ballet based on Tarjei Vesaas' book of the same name. Set to Terje Isungset’s musical arrangement with choreography by Kristian Støvind, Isslottet tells the story of Siss and Unn, two teenage girls that find each other in an unlikely friendship. The story deals with issues of life and death, and how what once was light and delightful can turn dark and dangerous. 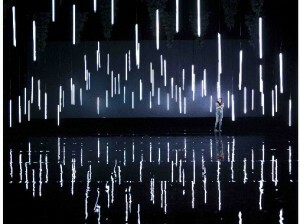 Wangensteen’s design called for the creation of dripping ‘ice taps’ which could incorporate a 3D movement that was reflected in the high shine stage floor and formed a vital part of the overall look of the show. To create this look, a total of one hundred 100cm Multichrome tubes were hung in clusters of five on motorized battens, each of which could be separately controlled. The tubes were connected to 20 Artistic Licence Multichrome D1 controllers distributed in the rig. The D1s were connected to Artistic Licence's Data-Lynx O/P Art-Net converters which received data from a videoserver to provide a dynamic 3D video impression on the tubes in combination with two 20' Ansi Lumen Barco Projectors. "We chose the Multichrome Tubes for this project as we wanted to make a modern visualisation of dripping ice taps which could create the impression of three-dimensional movement," explains Rubicon’s marketing director, Nicolai Perminow. "We were also very attracted to the Tubes’ opaque look which made them decorative, both with and without being lit. Multichrome Tube is a multi-pixel RGB LED fixture which can be supplied in customised lengths and different configurations, including single or double sided strips and a choice of pixel pitches. The Isslottet installation used double-sided strips. "The fact that the double-sided Tubes emitted light both forward and backward was also very interesting as we could use the Tubes to light the dancers as they moved around them during the play," continues Perminow. "The project combined lighting and video in very interesting ways and the Multichrome Tubes were a vital part of this. We truly enjoyed working with the Artistic Licence team who gave us great support for this wonderful project." The show was operated by video technician Eric Holmberg.